The Nature Conservancy (TNC), Georgia has received the $1700 donation from NASC. With the help of this donation, one of the Georgia's rarest natural communites will be maintained via biennial burns, invasive plant removals, and hydrology restoration. TNC in Georgia writes, "every dollar we raise in Georgia is leveraged through public funding, landowner donations and other sources to bring over five dollars in conservation impact -- an excellent return in your investnment in our work." Originally NASC planned to donate a maximum of $1500 of the 2010 auction proceeds, but we were able to donate more from your auction support. While the extra amount might not seem a lot, it goes a long way for non-profit conservation organizations. We thank everyone who contributed to the auction this year. 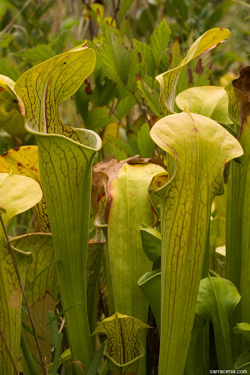 The donation help maintain and protect the endangered green pitcher plant (Sarracenia oreophila) listed on the US Endangered Species Act and CITES Appendix I.